For weeks flowers from Hyacinth Sunrise Mix, newly planted this year, have been delightful. Last week I tried to use several hyacinths in an arrangement but the stems shredded apart. Determined to try again, I placed three quickly and firmly into a floral pin. 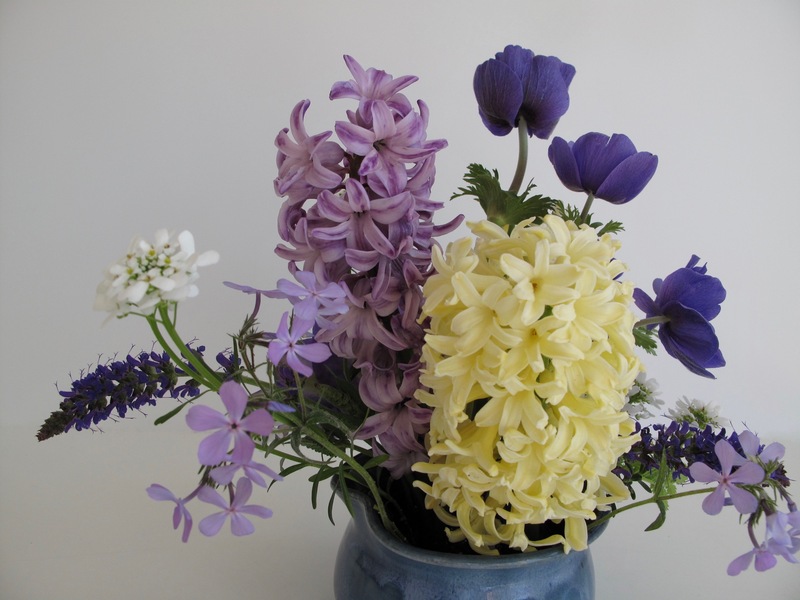 With no rearranging and fussing this time the hyacinths stood fine, a lilac-colored one and two soft pale yellows. Phlox divaricata ‘Blue Moon’ was the first flower collected for today’s vase but there was not enough to feature. Just mere wisps in the vase, its presence is enough to highlight the color of the lilac hyacinth. The first flowers of Clematis ‘Jackmanii’ opened this past week. Placed low and off-center it makes a perfect focal flower to accompany the hyacinths. Anemone coronaria ‘Mr. 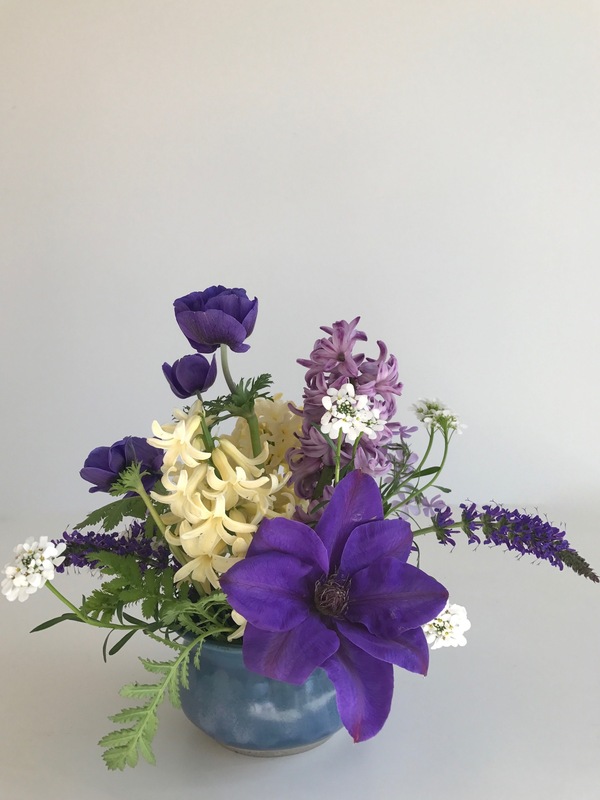 Fokker’ and newly opened Salvia nemorosa ‘May Night’ reiterate the purple hue of the clematis, and are placed to add height and width to the design. Freshly emerging, new leaves of Tanacetum vulgare (Tansy) are tucked around the base of the container and Iberis sempervirens (Candytuft) add a bright pop of white. This arrangement was designed to be viewed from the front but even from the back the appealing textures and colors of the April garden shine through. Here is one more look from the front. 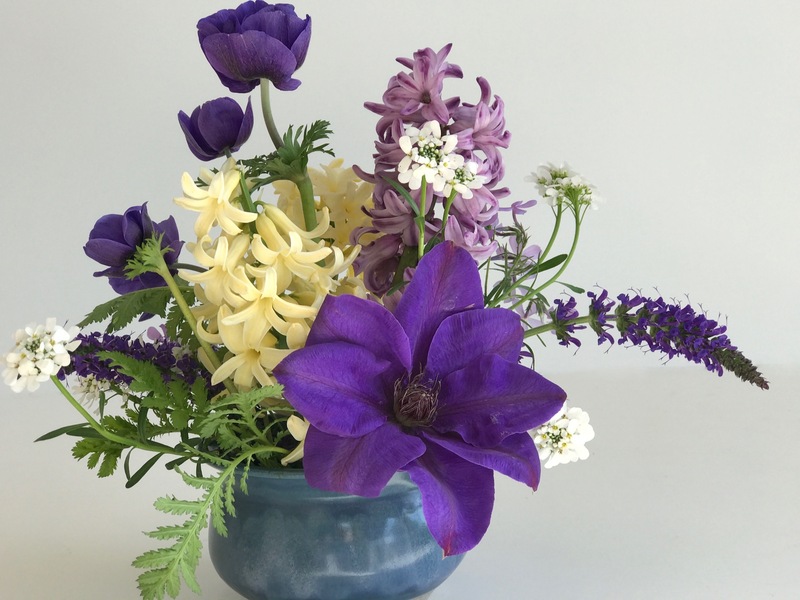 This entry was posted in garden and tagged 2017vase, clematis jackmanii, flower arranging, flower design, hyacinth sunrise mix, Iberis Sempervirens (Candytuft), in a vase on monday, nature photography on April 3, 2017 by pbmgarden. I’m in love with this arrangement. You did each bloom complete justice individually and as a whole group; a gorgeous definition of spring. I can imagine how delicious it smells too with the hyacinth! I appreciate your comment. I like my arrangements best that achieve that very thing. The hyacinths are heavily fragrant, slightly spicy. Thank you. The hyacinths are sweet and spicy Judy. I love catching a whiff of them when spending time in the garden. The depth of color in those purples is amazing. A stunning start to the week. Thanks Linda. I am always looking to add more purples/blues to the garden. The purples are so pretty. I also wish I could smell the hyacinths. Wish you could too–they are a treat to me but some may find them overwhelming indoors. I would call that purple perfection! Beautiful, does the Clematis last when cut? Thank you! Theoretically the clematis should last a week–mine rarely makes it that long. So pretty I just feel like the Clematis is one of those ephemeral vasers! I’ve read 7 days but mine usually keep only 2-3. Gorgeous! I love the lavender and deeper purple with the ivory– an old-fashioned, lavender-and-lace combination. Thanks Eliza. It does have a nostalgic feel, perhaps the hyacinths which seem old-fashioned to me. I would think “Purple Perfection” might have been considered as an apt title. Lovely. Thanks John. My favorite colors. I knew you wouldn’t be beaten by the Hyacinths Susie! I love how the colours work together to help the blooms stay separate in the arrangement, I have to admit I almost like the back view more than the front. You know, I think those hyacinths last week were waterlogged from some heavy rains the day before, making them particularly vulnerable. Glad I conquered them this week! Wow, the mix materials and colors is artful, indeed, and screams of spring. Such a joy to behold. Thanks Chronica. Spring has been delightful this year. I LOVE this color mix, Susie. 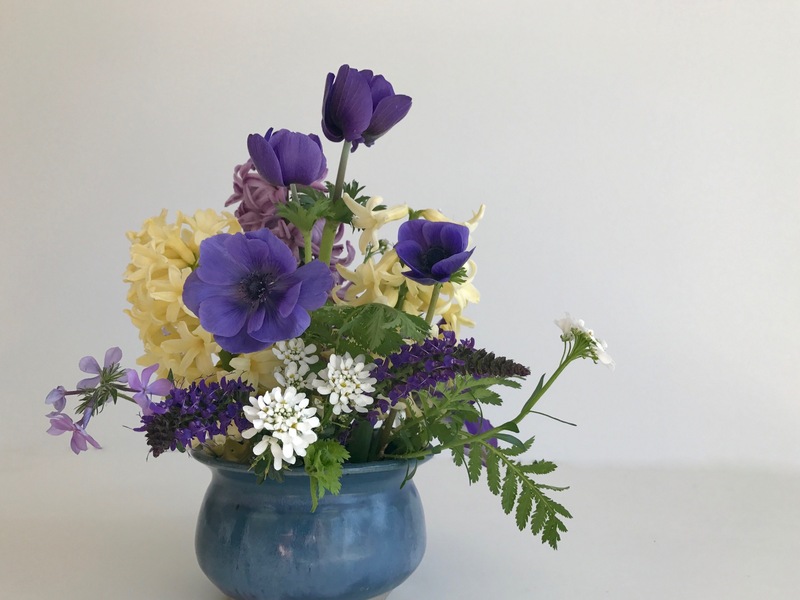 That Clematis bloom, echoed by the purplish blue of the Anemones, is perfect. You have me re-thinking Hyacinths too – they wouldn’t do well in the garden here but perhaps I shall try forcing some to bloom in the house next year. Thanks Kris. If everything in my garden were blues and purples I’d be happy a long time. Rediscovered hyacinths 3-4 years ago and have enjoyed them immensely. Forcing indoors would be good where you live. I notice on some of our warmer days, the heat gets to them. I love all the blues and the varied flowers. So many wonderful flowers in close up view. And perseverance paid off! Different flowers do need different treatments, there is a lot to learn but also new ways to find. Assembling vases each week has been a great learning experience for learning about properties of different flowers. I love those blues also. Have a good week. When I saw your title and first picture I immediately thought of vanilla and chocolate! A delicious mix of purple and cream – your garden must look pretty right now! Yum! The hyacinths were a great investment last fall. Unfortunately I was unable to get them all planted, but I am learning (or relearning) how valuable bulbs can be for early color). What a great choice of flowers you have in your garden Susie – I particularly love Mr Fokker – such a fabulous colour – mine are just starting to flower. My hyacinths have almost all gone over – it has been quite warm for April and there has been a drying wind which hasn’t helped the flowers. I look forward to seeing Mr Fokker appear in one of your vases soon Julie. The color delights me and I wish I could get a new patch to grow. Have a wonderful week. Beautiful arrangements and I can imagine the rich scent from those hyacinths. Thank you Malc. The hyacinths do have a rich, spicy fragrance–a nice bonus. I love the simplicity of this! And there’s something about ceramic vases. Over time, I’m adding more and more ceramic vases and pots to my collection. They’re so warm and full of personality. Lovely. Thanks Beth. I collected ceramic pots long before flower arranging entered my mind. Blue/purple are always a knock-out – as are your vases! I’m intrigued by the idea that you might have Clematis jackmanii and Salvia flowering at the same time as hyacinths – it would never happen here! I love the silhouettes of those darling little anemones. Thanks Cathy! In February we set records for 3 80-degree F. days in a row, followed by a cold snap that damaged my hydrangeas. It’s been interesting to see what opened early and what held back. The natives seem to be a bit more cautious. Oh my gosh, what a beautiful vignette from the garden. The soft and then saturated colors with the varying forms is perfect! Thank you. The hyacinths set the tone for the whole design. Really glad I planted them. You know, your flower arrangements are exceptional. 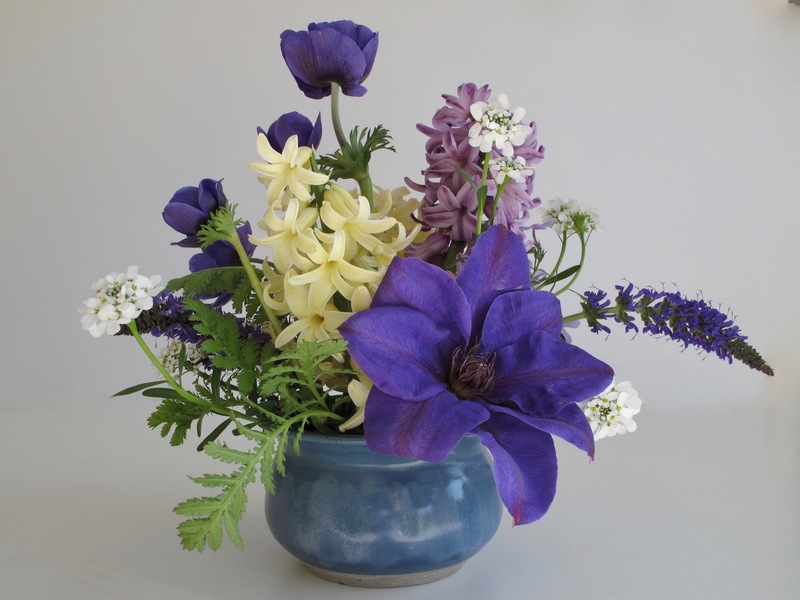 I never thought that Clematis can be used as a cut flower but it certainly can from your arrangement. Thank you so much. Actually the clematis lasted about 2 days, but it was worth it for the impact.